Leigh Brackett created a hard character in Eric John Stark, also known as N’Chaka, the man without a tribe. He is probably the most brutal pulp magazine character since Conan the Cimmerian. Leigh Brackett grew up reading Edgar Rice Burroughs. The book that started it all was The Gods of Mars. She told writer David C. Smith that she loved Robert E. Howard. After high school, she began writing and attempted to break into Argosy and Adventure with no luck. By chance, she had sent a manuscript to Laurence D’Orsey’s writing agency where Henry Kuttner worked. Kuttner took an interest and became Leigh Brackett’s mentor. He also introduced her to Julius Schwartz, an agent that specialized in science fiction. 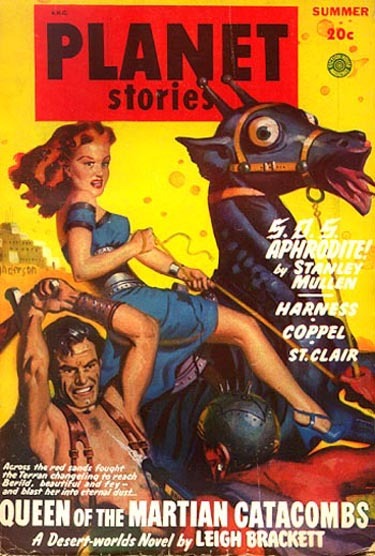 She began selling to the science fiction magazines in 1940. It was Henry Kuttner who introduced her to Dashiell Hammett and Raymond Chandler. In time, Leigh Brackett was placing hard boiled detective stories with the detective pulps. By the mid-1940s, she was the star writer for Planet Stories. The stories improved in plot and characterization. She wrote a mystery novel No Good From a Corpse. In time, Brackett had a unique writing style that was a mix of hard-boiled and lush. She was able to dust off the obsolete sword and planet story and make it work within a 1940s context. She was a master fictioneer when she introduced readers to Eric John Stark in “Queen of the Martian Catacombs” (Planet Stories, Summer 1949). Stark is found and raised by “half-human” aborigines on Mercury, when an earthquake destroyed the Earth settlement. Miners came in and wiped out the aborigines and put Stark in a cage. Simon Ashton of Earth Police Control saved Stark and brought him up. Stark became a mercenary specializing in helping native peoples. If Tarzan was not born Lord Greystoke, he could have gone this route. Stark is described as being big, dark from the sun exposure of Mercury, and endowed with animal like reflexes. “Queen of the Martian Catacombs” has Stark run down by Earth police in the Martian desert. Simon Ashton is with them and makes a deal with Stark to act as his agent in preventing a holy war. An unscrupulous ruler of a Martian Low-Canal city is partnering with a barbarian chief, Kynon, to plunder half the planet. Specialist mercenaries and criminals are coming from all over the solar system to join up. Stark reaches the city of Valkis, sees an old enemy serving the same employer, and finds the mind transfer offered to the barbarians is a shame. The journey to the ancient ruins of Sinharat is beset with treachery and sandstorms. Stark finds out the Delgaun, ruler of Valkis and Berild, Kynon’s woman are both Rama. Rama are hundreds of years old and transfer their mind from body to body. There is a final showdown and the conspiracy is defused leaving a few corpses on the way. Stark travels to Venus in “Enchantress of Venus” (Planet Stories, Fall 1949). Brackett returns to the vaporous Red Sea that was the setting for her “Lorelei of the Red Mists” (1946, with Ray Bradbury). Descendents of barbarians from the high plateaus are excavating the ruins of a pre-human city looking for super-scientific weapons with slave labor. Their plan is to conquer all Venus. Unfortunately, the ruling family has a streak of insanity. Stark is taken as a slave but that does not last for long. He leads a revolt and puts an end to all this nastiness. Stark returned to Planet Stories for the Mach 1951 issue. He also returns to Mars. “Black Amazon of Mars” has Stark taking a dying friend back to his native city in the north of the planet. The friend entrusts Stark with a talisman he had stolen wanting him to return it. 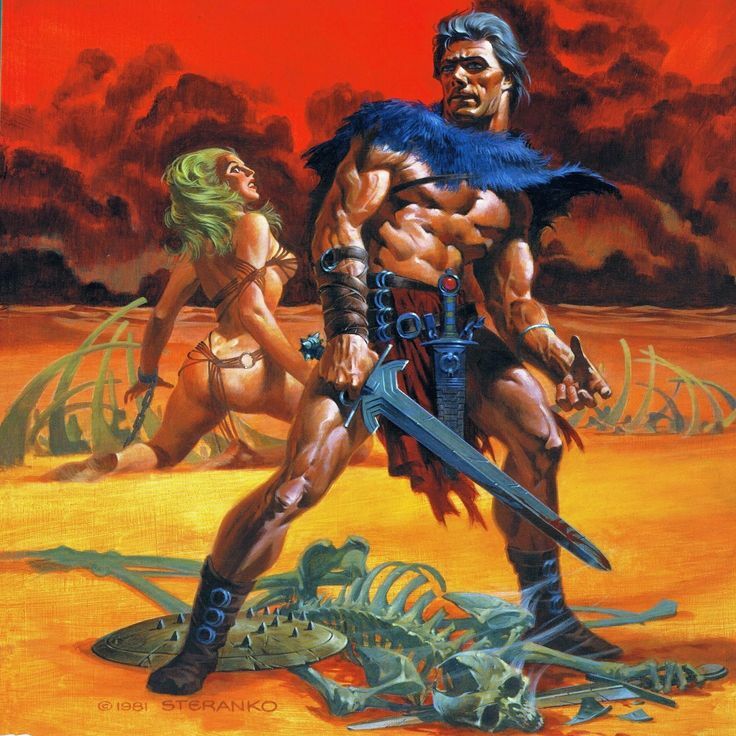 The barbarians of Mekh take Stark prisoner where he meets the leader, Ciara who wears a helmet hiding his head. Ciara has Stark tortured surmising he knows of the talisman. Stark escapes to the city of Kushat warning the inhabitants they are about to be attacked. During the attack, Ciara is revealed to be a woman. Stark leads refugees from the city to the Gates of Death to the city of the god Ban Cruach. Tall, golden aliens inhabit the city of Ban Cruach and take Stark, the pursuing Ciara, and the other refugees prisoner. The aliens communicate through the talisman with Stark. They intend on torturing them to death. Stark and Ciara cut their way out and destroy the source of power of the aliens. Stark decides to join Ciara at the end of the story. These were all novellas in length. “Queen of the Martian Catacombs” was expanded by about 40% to become The Secret of Sinharat. “Black Amazon of Mars” was slightly expanded to become People of the Talisman. Interestingly, Edmond Hamilton, Leigh Brackett’s husband expanded the novellas to became an Ace Double paperback. In the mid-1990s, I wrote an article called “Lin Carter: The Inept Pastichest” for my REHupa zine. The article was published in book form as “Lin Carter: The Inept Pasticheur” in The Fantastic Worlds of Robert E. Howard. 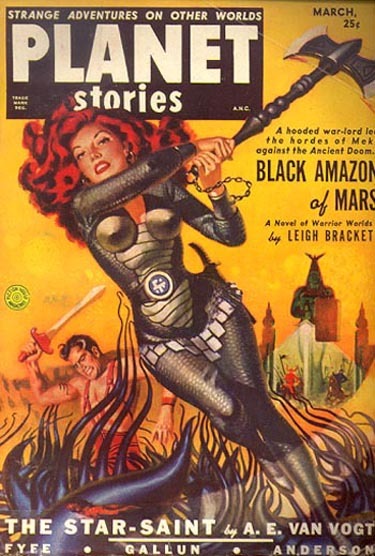 L. Sprague de Camp in his usually bi-monthly letter in REHupa bemoaned that he did not approach Leigh Brackett first to co-write Conan stories instead of Lin Carter. De Camp had realized in hind sight that Brackett had a much better grasp on barbaric characters than Carter (or himself). Brackett wrote some great stories, with some passages of incredible exoticism that seem never to fail to enthrall SF readers when you quote them. I think the first page of Secret of Sinharat has one fine example. When it comes to Eric John Stark, don’t forget the Skaith series. I have books 1-3 collected in a single volume, The Book of Skaith. Quite good from what I recall. The Skaith books are particularly interesting because they almost read like an allegory of everything wrong with liberalism, especially by the time you get to the last one. When I first read them, I was actually kind of annoyed that Stark took such a passive role; merely dragged along for the ride, basically, and that the series ended on a bit of an anti-climatic note. Now, however, I’ve come to appreciate it as nearly prophetic. My appreciation for them has grown tremendously. By Crom, I wish THAT had happened. The pastiches would then have been about the quality of Howard himself.